Imagine going on a diet and not having a scale to check your progress, or going to the doctor and not having your temperature taken. Feedback is important in our daily lives, and industry benefits by it, too. Generally speaking, feedback, or monitoring, is a tool that provides relevant information on a timely basis as to whether things are working as they were intended to. It’s an indispensable tool within the food manufacturing industry. Without it, entire plants could be erected exposing workers to injury and consumers to bacteria-laden products. It’s just plain common sense to monitor activities all along the way, starting with the design process. Now let’s see how monitoring is applied in HACCP Design Principle No. 4. Principle 4: Establish critical control point monitoring requirements. – Monitoring activities are necessary to ensure that the critical limits established at each critical control point (CCP) established under Principle 3 discussed last week are working as intended. In other words, if the engineer identifies significant risks in the design of a piece of food processing equipment and establishes critical limits at CCPs to eliminate the risk, then the CCPs must be monitored to see if the risk has actually been eliminated. Monitoring can and should be performed in food manufacturing plants by a variety of personnel, including design engineers, the manager of the engineering department, production line workers, maintenance workers, and quality control inspectors. For example, engineering department procedures in a food manufacturing plant should require the engineering manager to monitor CCPs established by the staff during the design of food processing equipment and production lines. Monitoring would include reviewing the design engineer’s plans, checking things like assumptions made concerning processes, calculations, material selections, and proposed physical dimensions. In short, monitoring should be a part of nearly every process, starting with the review of design documents, mechanical and electrical drawings, validation test data for machine prototypes, and technical specifications for mechanical and electrical components. This monitoring would be conducted by the engineering manager during all phases of the design process and before the finished equipment is turned over to the production department to start production. To illustrate, suppose the engineering manager is reviewing the logic in a programmable controller for a cooker on a production line. She discovers a problem with the lower critical limits established by her engineer at a CCP in the design of a cooker temperature control loop. You see, the time and temperature in the logic is sufficient to thoroughly cook smaller cuts of meat in most of the products that will be made on the line, however the larger cuts will be undercooked. The time and temperature settings within the logic are insufficient to account for the difference. This situation illustrates the fact that monitoring does no good unless feedback is provided with immediacy. 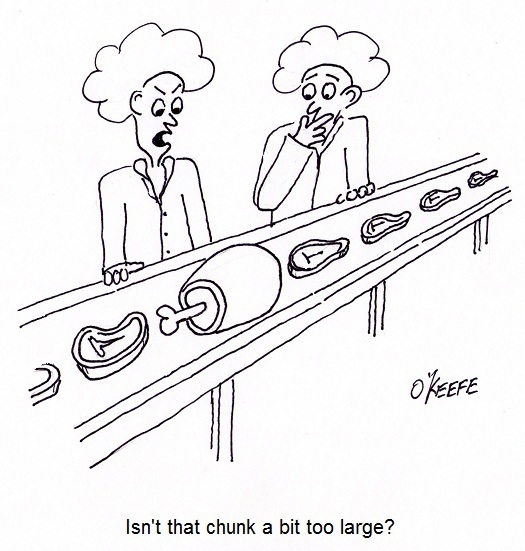 In our example, the design engineer who first established the CCP and the critical limits was not informed in a timely manner of the difference in cooking times that different size meats would require, resulting in the writing of erroneous software logic. Fortunately, continued monitoring by the engineering manager caught the error, leading her to provide feedback about it to the design engineer, who can then make the necessary corrections to the software. Next week we’ll see what design engineers do with the feedback they’ve received, as seen through the eyes of HACCP Principle 5, covering the establishment of corrective actions.